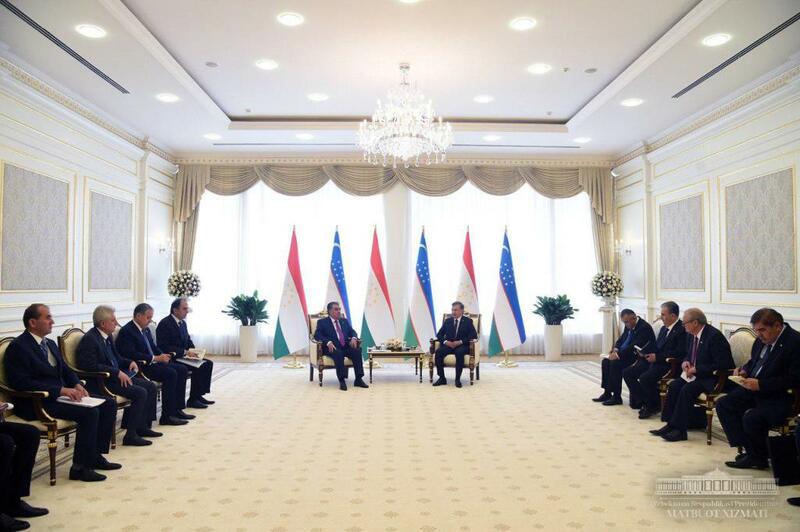 Uzbek President Shavkat Mirziyoyev met Emomali Rahmon at Tashkent International Airport on Friday and the two presidents held a one-on-one meeting at the Kuk Saray Palace later in the day. Mirziyoyev noted in the course of the talks that the state visit by Tajik President Emomali Rahmon to Uzbekistan opens up new prospects for bilateral ties between the two countries, according to the Uzbek president’s official website. President Emomali Rahmon reportedly expressed gratitude for invitation and sincere and warm welcome and noted that the meeting was a good opportunity to discuss state and prospects of further expansion of bilateral cooperation between the two nations. Tajik leader also noted that Mirziyoyev’s visit to Dushanbe in March this year had restored ties between the two countries and boosted the development of bilateral cooperation. Emomali Rahmon's state visit to Tashkent was the first by the Tajik leader since 1998. During Islam Karimov's 27-year rule in Uzbekistan, its relations with Tajikistan and other Central Asian nations were strained by disputes over transit routes, border security, water resources, and other issues. Shavkat Mirziyoyev, who came to power following the death of Islam Karimov in 2016, has said mending of better relations with Uzbekistan's neighbors is a priority for his government.